A living lab for better urban waterways. We bring WaterStories to life. Our main deck is open for TankerTime weekdays 10am-6pm. When staff are working late (often), the deck will be open later, same thing during weekend days. Come enjoy a hammock, some of our books, the ArtTable, the TankerTots play area with toys and kiddie pool, bring your lunch or schedule an office meeting at one of our tables. It's Free! Our cat Chiclet requests that all dogs be kept on a leash. We offer evening Second Sundays TankerTime, 5pm-midnight, on the Second Sundays of May, June, July, August, and September. This communal happening has people picnicking, reading, chilling on deck. BYOB and food, but we take care of the musicians who jam. Their jam of Mediterranean music (WaterStories of the Wine Dark Sea) starts around 9:30pm. September 2018, we are inaugurating a WaterStories quiz show (think Jeopardy) once it is dark enough to project an image outside. 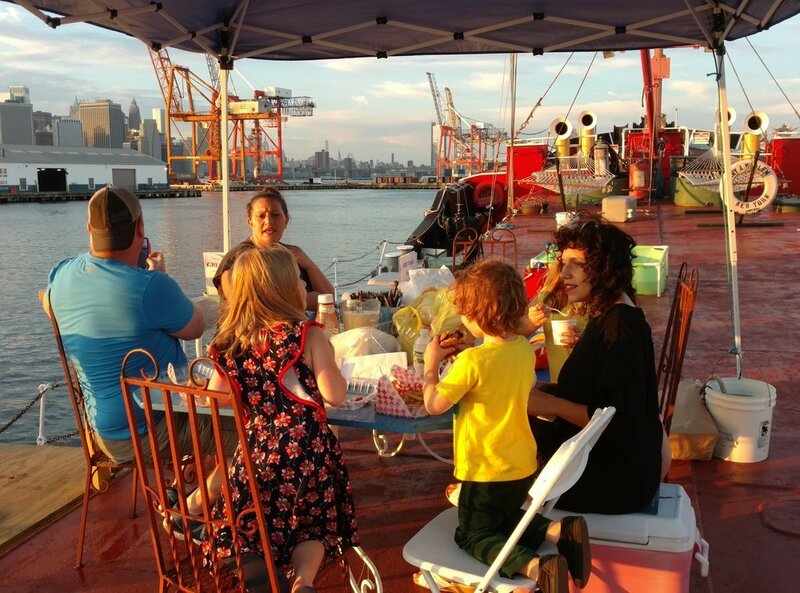 While PortSide NewYork has its offices aboard the ship, the ship interior is only open to the public during special public TankerTours or for group and school visits by appointment. If you are such a group, please send us an email. Another way to experience the ship is to participate as a volunteer. We can use skills of various sorts. 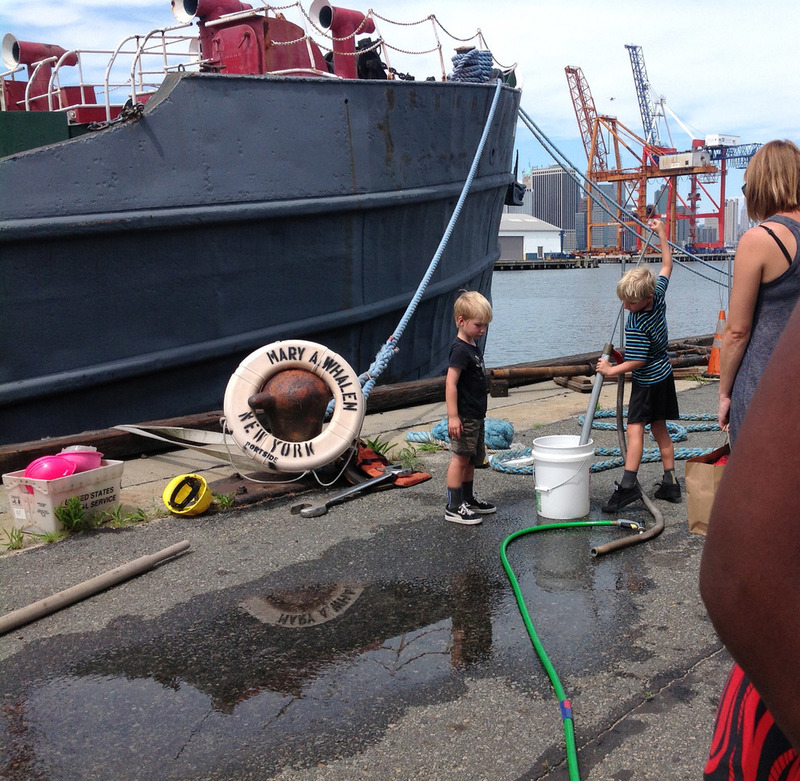 Off the ship: PortSide NewYork also runs WaterStories programs off the ship, and the best way to find out our program schedule and ship access is to subscribe to our newsletter. PortSide NewYork's home is the tanker MARY A. WHALEN, on Pier 11, Atlantic Basin next to the Brooklyn Cruise Terminal in Red Hook, Brooklyn. Closest street address is 190 Pioneer Street. Citibike dock "Pioneer St & Van Brunt St" is half a block away. We are next to the Brooklyn Greenway at Pioneer and Conover Streets. We are a block and a half from Van Brunt Street where the B61 bus stops. Go to our Red Hook WaterStories website and click the map, then click the map layer "MTA bus stations" to see where we are relative to the bus stations. Cab/car service/Uber drivers usually can't figure out how to get into Atlantic Basin, so head to 159 Pioneer Street, the address for Pioneer Works. With your back to Pioneer Works, look to your left. You will see PortSide signs on the chain link fence around Atlantic Basin terminal, and a pedestrian gate, with the ship visible behind it. If you really want to drive straight to the ship, tell your driver to follow signs for the Brooklyn Cruise Terminal from Imlay and Bowne Streets. Once inside Atlantic Basin, turn right at the end of the long Pier 11 warehouse with all the trucks. The new NYC Ferry stop for Red Hook is right next to us in Atlantic Basin. From New York Water Taxi stop at Fairway, Walk up Van Brunt Street to Pioneer Street, take a left, walk to our Pioneer and Conover Street gate. From IKEA is a longer walk (left on Beard, right on Van Brunt, left on Pioneer) or you can take the B61 bus to the Pioneer Street stop. Take the A train to Jay Street Borough hall. Exit the subway station, walk two blocks south on Jay St, across Fulton, to the bus stop on the left or east side of the street at the Smith St and Livingston Street stop and take the B61 bus heading to Red Hook. Get off at Van Brunt and Verona Streets. Continue south on Van Brunt, take a right on Pioneer and enter the gate in the chain link fence at the corner of Conover Street. Take F to Carroll Street. Exit at the front of train exit if you were coming from Manhattan, rear of train exit if you were coming from Brooklyn. Exit the station and go down 2nd Place (not 2nd Street). Go 2 blocks to Clinton Street, take a right. Go five blocks and turn left onto Sackett Street. Go four blocks until it dead-ends onto Van Brunt Street. Take a left. Go to the second light at Bowne Street and take a right, go one block and cross Imlay Street and enter a narrow gate. The roadway then hooks left and you bike all the way down, leaving the long blue shed to your right. The Mary Whalen is behind the far southern end of this shed. There are no bike racks in Atlantic Basin, so lock up to the fence, or exit the pedestrian gate at the southern corner and lock up to poles on the street. The shortest bike route from the F is down Hamilton Avenue, but that has heavy traffic entering and exiting the BQE. We recommend the Sackett Street entrance to Red Hook as the safest. Take F/G to Smith & 9th Street stop. Take a right out of the station to Smith St. Cross Smith and walk one short block to Mill St. Turn right, heading towards Hamilton Avenue (under the BQE). Make the crossing, underneath the highway, and continue straight on Mill St. Walk through NYCHA public housing. Enter Coffey Park at Dwight St. and continue straight across the park to exit at Pioneer Street. Walk down Pioneer Street two blocks to the corner of Pioneer and Conover Street and enter a small pedestrian gate in the chain link fence there. The ship is ahead of you and slightly to your right. It's about a 30 minute walk from the F or G at to Carroll St. There is a pedestrian bridge on Summit Street over the BQE that isn't featured on some maps. Exit the front of the train (if you were coming from Manhattan or Queens). From the station, take a right on 2nd Place, walk 3 blocks to Henry Street. Right on Henry, left on Summit Street (which is the extension of First Place). Cross the BQE via the pedestrian bridge that is slightly to your right at the end of the first block. Walk down Summit Street two blocks to Van Brunt. Take a left and go to the fourth block on the right (there are more on the left), Pioneer Street. Take a right at Pioneer, go one block and and enter a small pedestrian gate in the chain link fence there. The ship is ahead of you and slightly to your right. We do NOT recommend using GPS once you reach Red Hook because GPS does not understand that the Atlantic Basin/Brooklyn Cruise Terminal facility is closed off from the city streets by a chain link fence and large warehouses and has only ONE entrance for vehicles (at Bowne and Imlay) open every day. You WILL probably end up driving around Red Hook in circles if you use GPS after Hamilton Avenue. Download our written directions here (or read them below). Lots of free parking next to the ship. Take Brooklyn Bridge to Cadman Plaza exit, right at bottom of ramp, follow road as it turns down to the river, as if you were going to the River Cafe. Just before the river, take a left onto Furman St. Take Furman until you cross Atlantic Avenue where the road takes a bend and is renamed Columbia. Take Columbia about 6 more blocks to the 3rd light at DeGraw Street and take right. One block later, you will be forced left onto Van Brunt Street. The second light is Bowne Street. Take a right at Bowne, go one block and cross Imlay Street and enter a narrow gate. That puts you inside the Atlantic Basin complex. The roadway then hooks left and you drive all the way down, leaving the long blue shed to your right. The Mary Whalen is behind the far end of this shed (the Pier 11 shed.) At the end of the shed, turn right off the roadway, drive across the asphalt towards the ship and park. Exit at Atlantic Avenue, the exit after Brooklyn Bridge. Left at end of ramp onto Columbia. Take Columbia about 6 more blocks to the 3rd light at Degraw Street and take right. One block later, you will be forced left onto Van Brunt Street The second light is Bowne Street. Take a right at Bowne, go one block and cross Imlay Street and enter a narrow gate. That puts you inside the Atlantic Basin complex. The roadway then hooks left and you drive all the way down, leaving the long blue shed to your right. The Mary Whalen is behind the far end of this shed (the Pier 11 shed.) At the end of the shed, turn right off the roadway, drive across the asphalt towards the ship and park. Get on right side of tunnel, exit towards right at Hamilton Avenue. (You are basically getting out of the tunnel alongside the elevated BQE and turning left under it and left again to drive back in direction of Manhattan.) Stay in left lane once on Hamilton Avenue and at the first light (Clinton Street) take a left under the BQE. Take a left again (but not into the left-most lane as that will put you back into the tunnel) and follow Hamilton Avenue to the end to a T-junction with Van Brunt Street at the Tesla building. Take a left on Van Brunt, go one block to the next light at Bowne Street. Take a right at Bowne, go one block and cross Imlay Street and enter a narrow gate. That puts you inside the Atlantic Basin complex. The roadway then hooks left and you drive all the way down, leaving the long blue shed and lots of parked trucks to your right. The Mary Whalen is behind the far end of this shed (the Pier 11 shed.) At the end of the shed, turn right off the roadway, drive across the asphalt towards the ship and park. Exit Hamilton Avenue exit, stay way right on the ramp so that you don't get stuck in flow of cars going into the Brooklyn Battery Tunnel. The ramp dumps you onto Hamilton Avenue, stay in the center of traffic flow. Take Hamilton Avenue about 2 blocks after the tunnel entrance to a T-junction with Van Brunt Street by the Golten Marine building (now Tesla). Take a left, go one block to the next light at Bowne Street. Take a right at Bowne, go one block and cross Imlay Street and enter a narrow gate. That puts you inside the Atlantic Basin complex. The roadway then hooks left and you drive all the way down, leaving the long blue shed to your right. The Mary Whalen is behind the far end of this shed (the Pier 11 shed.) At the end of the shed, turn right off the roadway, drive across the asphalt towards the ship and park.